2- Designate a time (eg. after dinner) as quiet time. Every member of the family should get a book and read. A child tends to copy what they see their parents doing. If they see you reading, chances are they will too. Read aloud to younger children in a separate quiet spot. 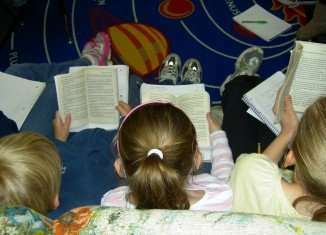 3- Get older children to read to younger siblings as part of their responsibilities. 4- Let your kids “EARN” gaming time by reading first. 5- Visit the public library at least once a week. Stay a while and explore. 6- Create a family reading club. Discuss books after completing them. For every book read – offer a compensation or reward. that they understand what they are reading). 7- Make 20 minutes of reading a day a family staple. the comics, horror stories, the Bible – as long as they are reading. 10- Build a family library of everyone’s favorite books. journey and an important habit they will cherish!